One of the things that has been most interesting to watch during this Stanley Cup Final (aside from the hockey) is the way the national media has started to see Victor Hedman for what he is: a Norris-caliber defenseman. Tampa Bay Lightning head coach Jon Cooper even went as far to say that this series has been 77's coming out party. I'd politely disagree with the coach and argue that Hedman has been this good for a while, but that's a blog for another day. What immediately jumps out there is Hedman's SCF (on-ice Scoring Chances For) percentage. It's noticeably higher than Keith's, Kane's, and Toews's. When Victor Hedman is on the ice, the Lightning are generating scoring chances. They say that the best defense is having the puck in the attacking zone, and Victor Hedman is proving that on most shifts. His tough matchups just haven't been able to get the job done. That has to be of some concern to Joel Quenneville, as his team prepares for tonight's Game Four matchup at the United Center. A few days ago I wrote a piece at HockeyBuzz regarding Cedric Paquette's shutdown work against Kane and Toews, but it's abundantly clear that 77 deserves a lot of credit too. 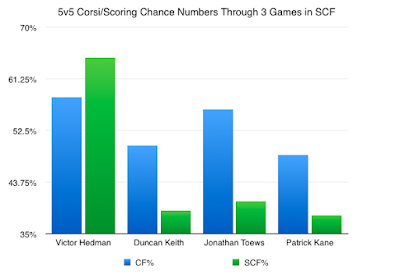 The other thing that sticks out in a big way is Hedman's Corsi numbers. There was a ton of talk about Keith's ability to drive possession coming into the series, but through three games it really has been the Victor Hedman show. He's beating Kane and Toews when he's been matched up against them, and Keith is struggling to keep pace too. Tasked with shutting down Chicago's best players, Hedman isn't just hanging on for dear life; instead, he's thriving. He's driving possession in a huge way, which the Lightning have struggled to do at times in the postseason. Further, even if Kane and Toews are putting up decent Corsi numbers, they haven't been able to generate scoring chances when 77 has been on the ice. Now, considering the small sample size, it would be nearly impossible to guarantee that this trend will continue. Betting against Chicago's two forward stars would be utterly foolish given their history. But, it's pretty remarkable to see what Victor Hedman has done through three games in this series. The national media has noticed, and you can bet they'll be watching him next year and for years to come. Next year's Norris conversation could be fun.